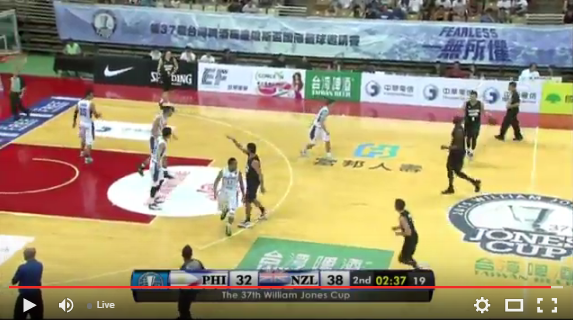 William Jones Cup 2015 live basketball game between Philippines' Gilas Pilipinas vs New Zealand is happening already and you shouldn't miss it. After Gilas Pilipinas' loss to Iran yesterday, now they should win every remaining game they have in Jones Cup 2015 preliminary round to ensure their entry into the next round, given the strong competition (Iran, Chinese Taipei A, Russia, South Korea are currently the Top 4 in the Team Standings). The lineup for Team Philippines vs New Zealand are: Calvin Abueva, Jayson Castro, Gary David, Dondon Hontiveros, Gabe Norwood, Marc Pingris, Aldrech Ramos, Troy Rosario, Matt Ganuelas- Rosser, Asi Taulava, Moala Tautuaa and Sonny Thoss. 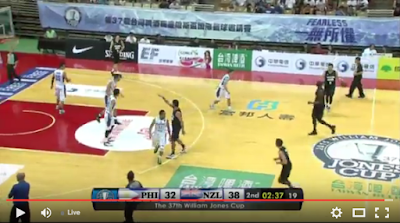 Both teams had a good start, but the Philippines struggled in the 2nd quarter, scoring just 8 points, as against 17 by New Zealand's Wellington Saints. The Filipino team certainly suffered the absence in the game of key player Terrence Romeo, who got injured during their game vs Iran yesterday.